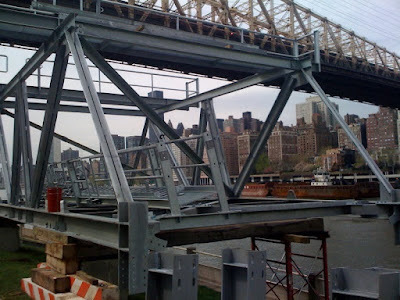 Working On Roosevelt Island Tram Towers, Cables & Cabins Removed, Tower Tops & Hanger Arm Installed Next - Will Americas Next Top Models Be Back Soon? and started work assembling the new tower tops. After 6 weeks, the construction is proceeding on schedule. 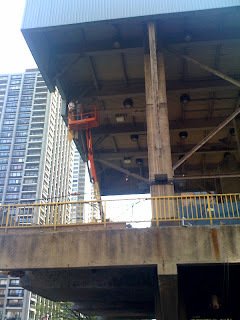 Cables and old cars are removed, demolition and removal of old machinery is almost complete. Tower tops are next. We are monitoring closely. The timing of when they choose to schedule work is up to the contractors. As might come as no surprise, the H2O work is delayed. 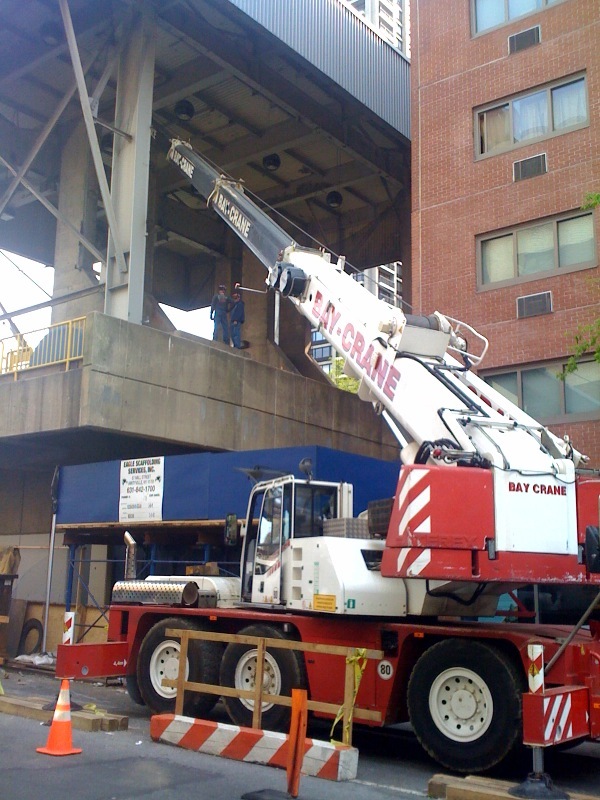 Crane permitting and street closure scheduling is all up to DOB and DOT. Earlier today a Tower Hanger Arm was delivered and is resting alongside it's new home to be. 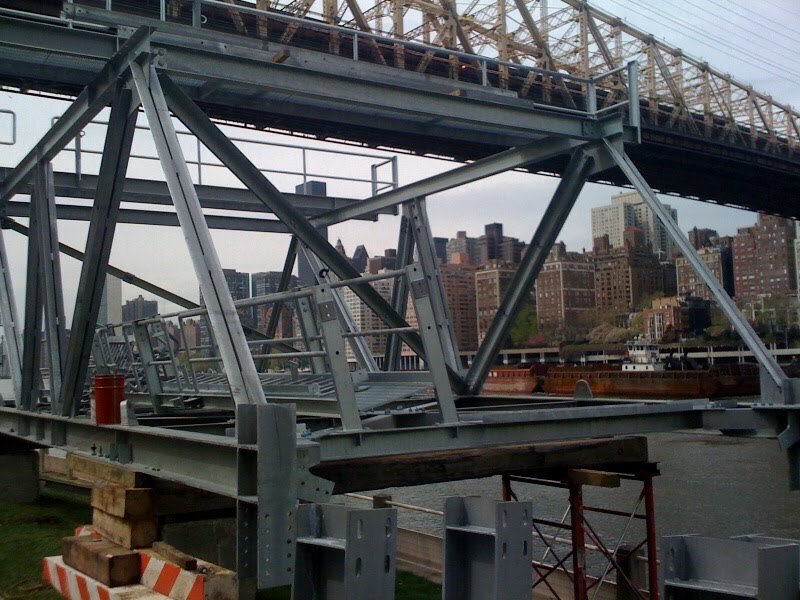 More information on Roosevelt Island Tram Modernization construction schedule available here. 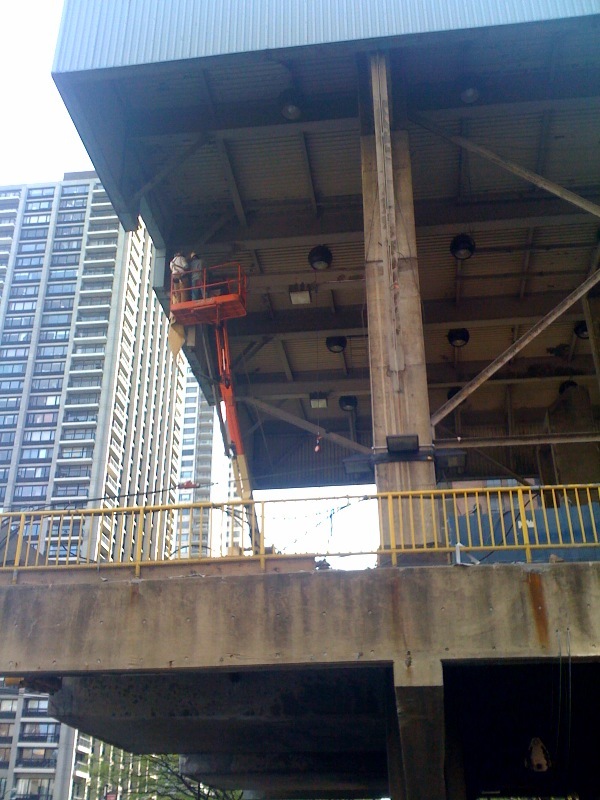 Work is also going on at the Roosevelt Island Manhattan Tram Station. or being hit on by Americas Next Top Model. Here's the scene from Americas Next Top Model on the Roosevelt Island Tram. Happens every day - doesn't it? 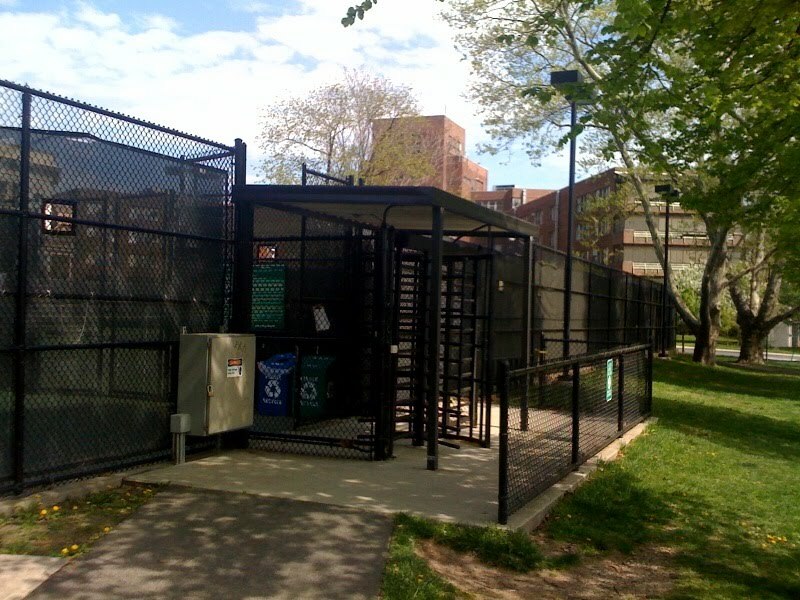 During the April meeting of the Roosevelt Island Residents Association (RIRA) Common Council Meeting a presentation (Copy Below) was made by the leader of a group of students from the Cornell Graduate Program In Landscape Design. The students are participating in a project initiated by Roosevelt Island Operating Corp. (RIOC) Director Jonathan Kalkin to help redesign Roosevelt Island's green spaces and pathways. 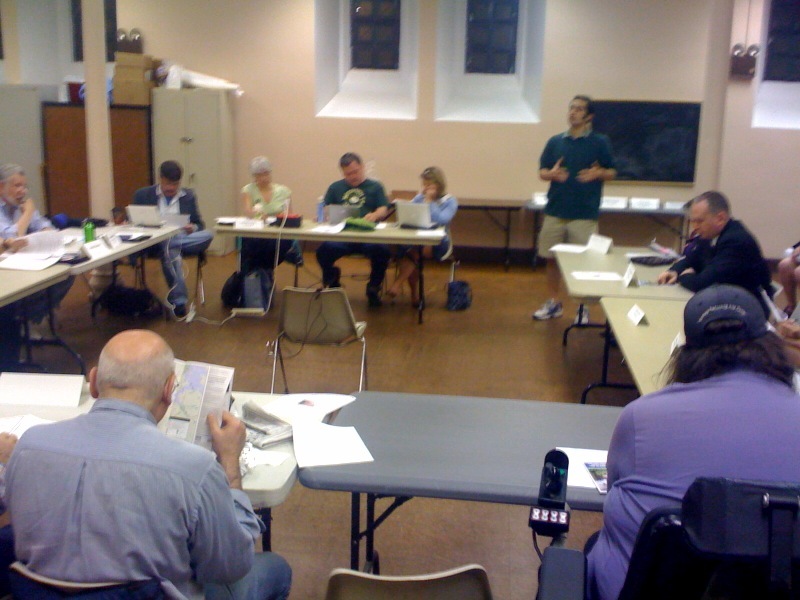 After several weeks of exploring Roosevelt Island, meeting with RIOC staff, RIRA members and other Roosevelt Island community leaders a preliminary plan was presented by the Cornell Landscaping team to the RIRA Common Council at the April meeting. The goal of the presentation was to receive comments, criticism and other feedback from RIRA members that the Cornell Landscape team can incorporate in a final Roosevelt Island Landscaping plan to be presented at the May RIRA meeting. 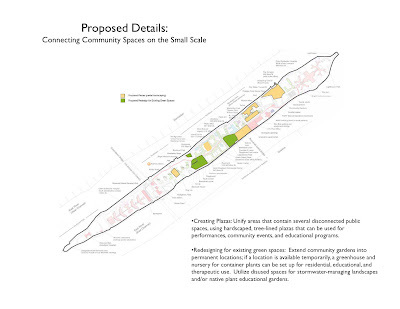 Creating Plazas: Unify areas that contain several disconnected public spaces, using hardscaped, tree-lined plazas that can be used for performances, community events, and educational programs. 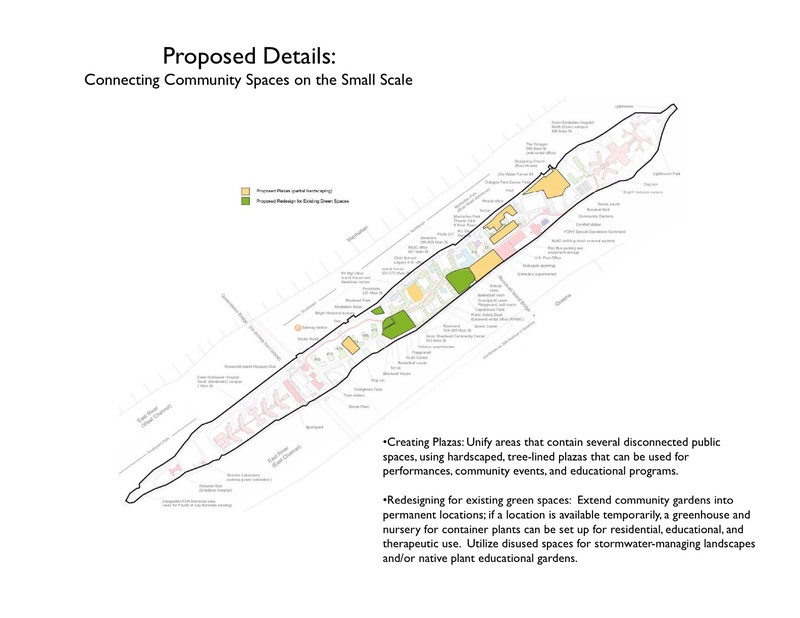 Redesigning for existing green spaces: Extend community gardens into Redesigning for existing green spaces: Extend community gardens into permanent locations; if a location is available temporarily, a greenhouse and nursery for container plants can be set up for residential, educational, and therapeutic use. Utilize disused spaces for stormwater-managing landscapes and/or native plant educational gardens. The Cornell Group is seeking any additional feedback on their proposals (Page 19). Do you have any questions about this preliminary plan? Are there any features of it that are especially exciting, or especially worrisome? 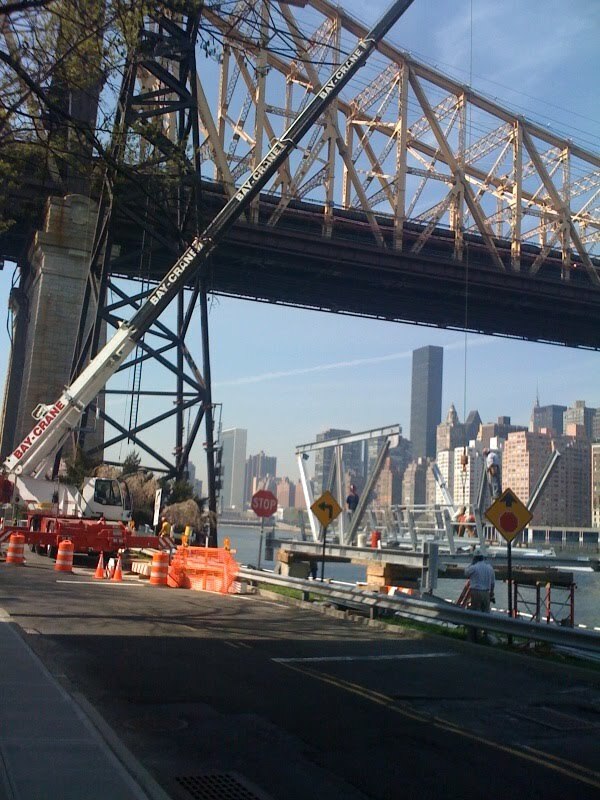 What do you feel are the best things about living on Roosevelt Island? What are the worst things about living here? Any other comments? Things we have overlooked? 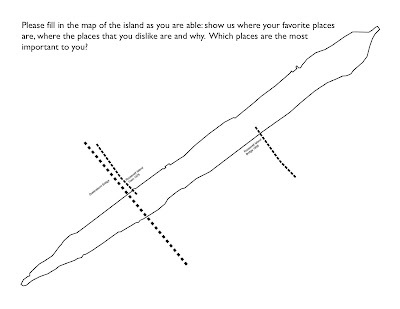 Ideas you have for the island’s landscapes? 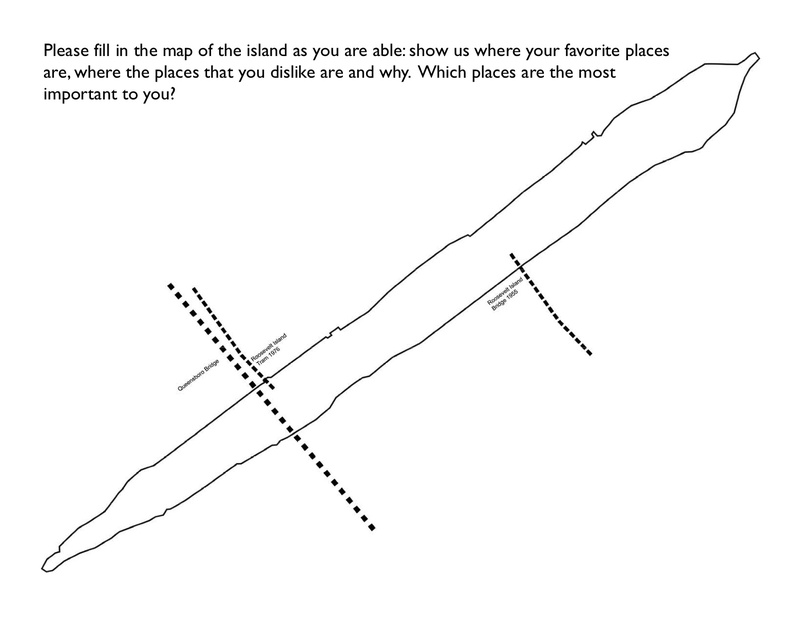 Click To Enlarge Image and tell your favorite Roosevelt Island places you like and dislike. Remember these are preliminary proposals and a final plan will be presented at the RIRA May Meeting. Of course, none of these proposals are binding upon RIOC but are helpful suggestions. Below is a copy of the Presentation made before the April RIRA meeting. 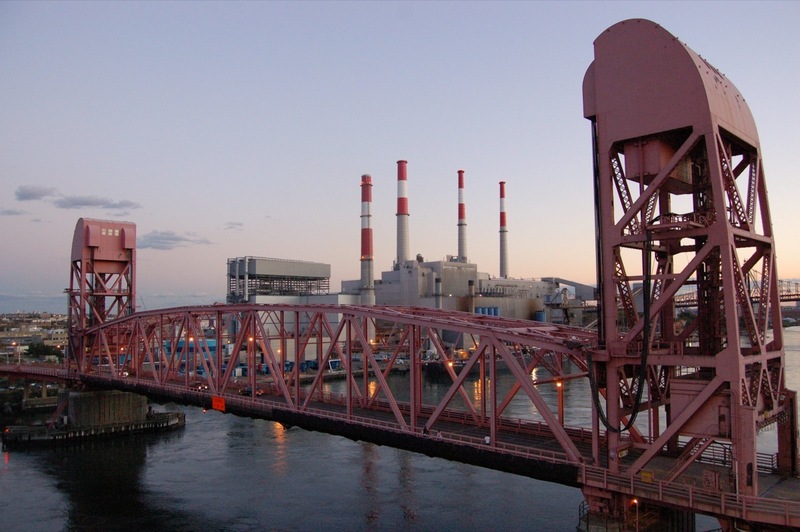 Roosevelt Island has been the beneficiary of several other recent University Projects including the Columbia University Roosevelt Island Transportation Study and Hunter College's Access RI Accessibility Study. Tennis Court Access- Male gained access to the Tennis Courts with the card of another. PSD responded and escorted him out. RIOC personnel notified. ...Players must not allow entry to non-permit holders. Failure to observe this rule may result in suspension or revocation of permit without reimbursement, as well as the arrest of unauthorized persons who trespass in the facility. ... This facility is available for RIOC Tennis Permit holders and their guests only. New York City Parks Department permits are NOT valid. -Season fees are:-Adults $100 :-Seniors (62 and over) $20 :- Juniors (18 and under) $10 :-Instructors $200. There is a $10 charge for replacing lost or stolen cards. YOU MUST ALLOW THREE BUSINESS DAYS FOR CARD PROCESSING. PLEASE SEE ABOVE FOR PASS PICKUP HOURS. -Courts will be open from 6am until 10:30pm every day. Courts are maintained by RIOC from April 1 through November 30, but permit holders will be able to access the courts through March 31, 2011. -No advance reservations. Play is on a first come, first served basis. All players must sign in, noting the time and court number when they take possession of a court. Failure to sign in, or signing in with a false start time, will allow any waiting players, with valid permits or guest passes in hand to assume that the court has been occupied for its allotted time (1 hour for singles, 2 hours for doubles) and to ask the players not signed in to relinquish the court. -PRIMETIME HOURS: 6pm-10:00pm weekdays, 9:30am-2:00pm weekends and holidays. No ball baskets, individual practice, or private lessons during primetime hours. 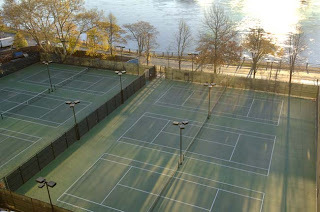 -Court monitors from the Roosevelt Island Operation Corp. and/or the Roosevelt Island Tennis Association (RITA) will oversee the facility during primetime hours and on a spot-check basis during non-primetime hours. Monitors oversee court use and settle disputes. Compliance with their requests is mandatory. -Court 4 is reserved every weeknight 6pm to 10:00pm for RITA lessons and community programs. This court may be released for general play at the discretion of the RITA official in charge. No other instruction/coaching is permitted during primetime hours. Permit applications for players and instructors are here. Vision 2020 Waterfront Meeting Still Asks The Question Why Can't Roosevelt Island Residents Access The East River? 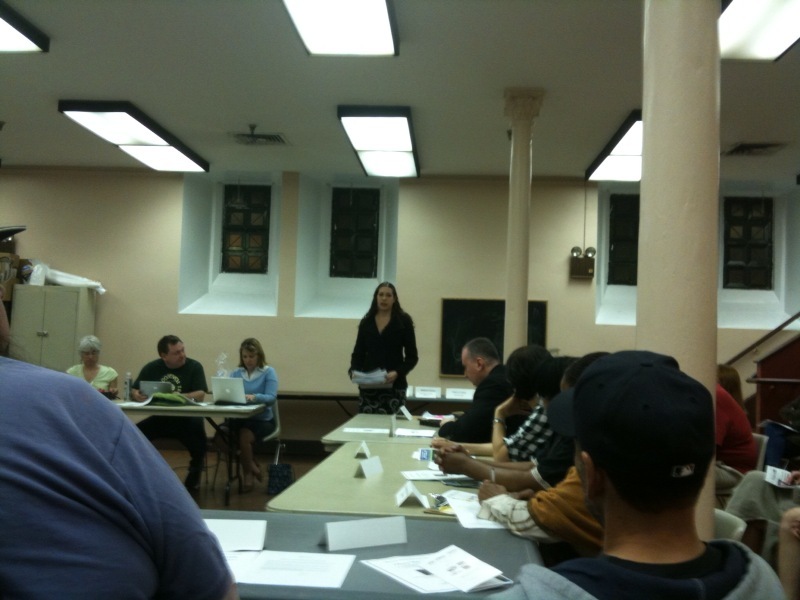 The first citywide public meeting to kick off the outreach process was held on April 8th. A copy of that presentation and a summary of the comments received will be posted to this website shortly. Thanks to all who attended the kick-off meeting. We will be announcing the next set of public workshops soon! Stay tuned! Here's more on the question Why Can't Roosevelt Islanders Get In The Water (including wonderful Great Big Sea video with the Chieftains) and the potential for a kayak launch from Roosevelt Island. 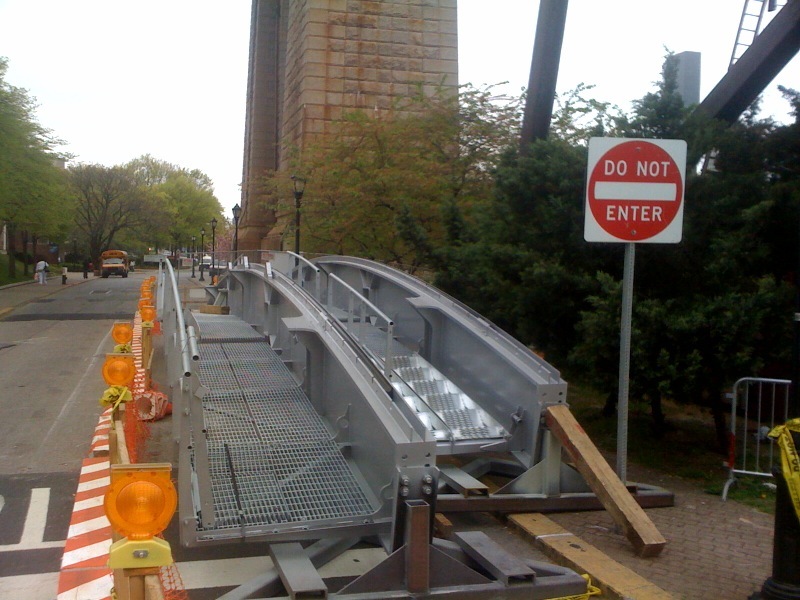 Reminds me of this 2007 post on the lack of Roosevelt Island waterfront access. I have often passed Roosevelt Island on a Ferry Boat but never a sail boat. The video above illustrates what a great experience it must be. As a waterfront community it is a shame that Roosevelt Island does not take more advantage of being surrounded by the East River. 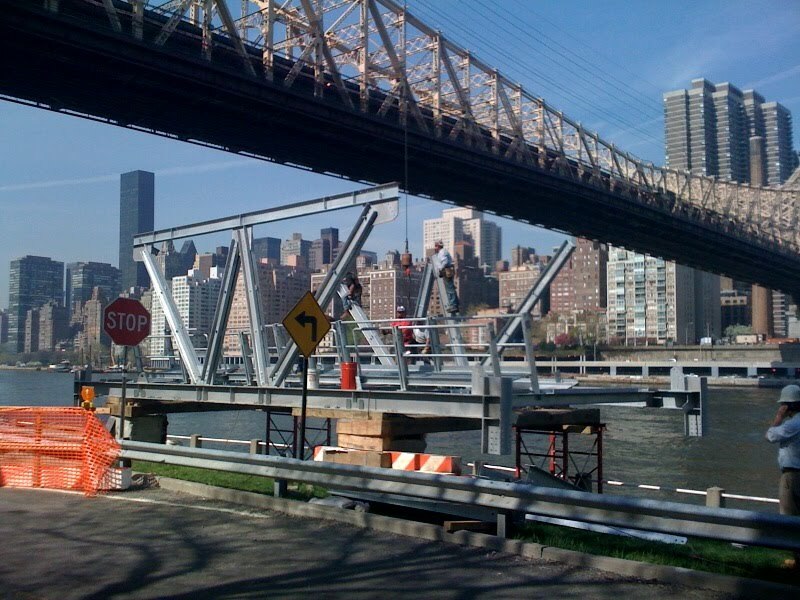 For example, it would be great for a boat house and kayak launch to be established on Roosevelt island as it has been right across the river in Queens at the Long Island City Community Boat House. 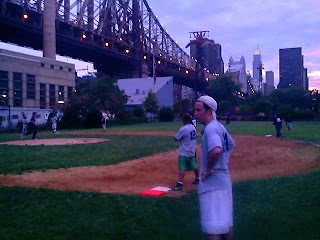 and at East River Crew on East 96th Street. Several years ago I inquired of RIOC about the possibility of a Kayak launch here and was told that the currents were much too strong to safely permit. 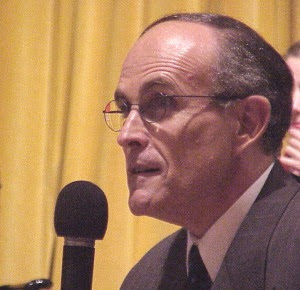 But others with practical experience of such matters advised that with proper guidance a kayak launch could readily be created on Roosevelt Island. 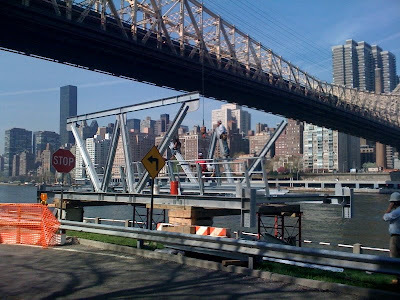 Wondering what is going on with the Roosevelt Island Bridge Re-Construction Project being undertaken by the NYC Department of Transportation (DOT)? Below is the DOT Roosevelt Island Bridge Spring 2010 Reconstruction Newsletter, which reports that the project is not scheduled to be completed until March 2011. 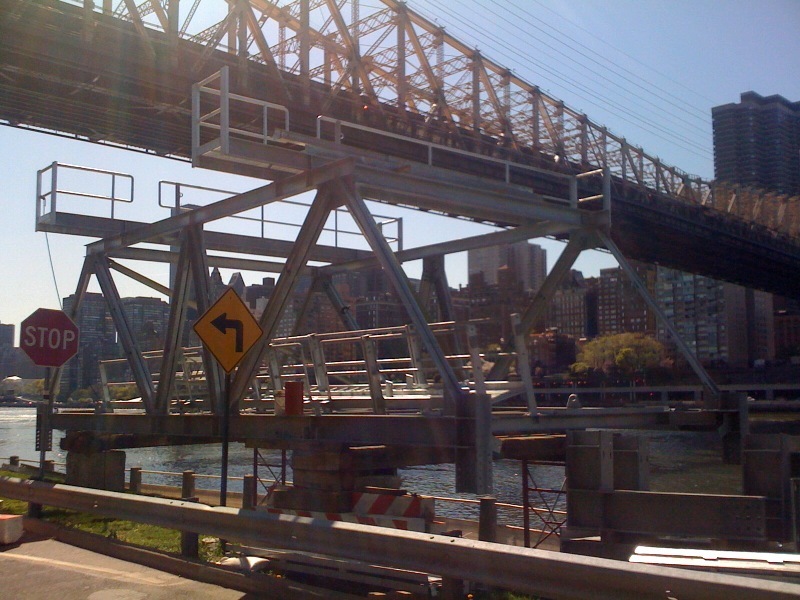 NY 1 reported on a September 2007 incident when the Roosevelt Island Bridge lift got stuck stranding people on either side for hours. Received report from Roosevelt Island resident Trevre Andrews on this morning's F train commute. RIRA passed the resolution below in support of the East River Greenway Alliance initiative. More on the East River Greenway Initiative. The ERGI is very grateful for the hospitable treatment RIRA accorded Dennis Markatos-Soriano, Executive Director of the East Coast Greenway Alliance, as he made his presentation in support of the resolution. He and I would be happy to answer any further questions or supply information. 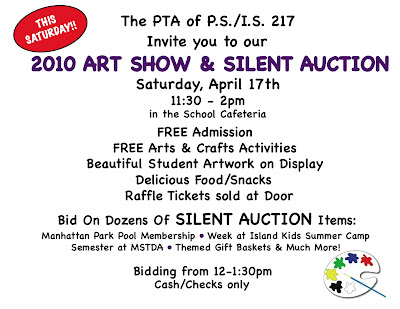 Roosevelt Island PS/IS 217 PTA Art Show & Silent Auction Saturday April 17 In School Cafeteria - Come Support Local Kids! 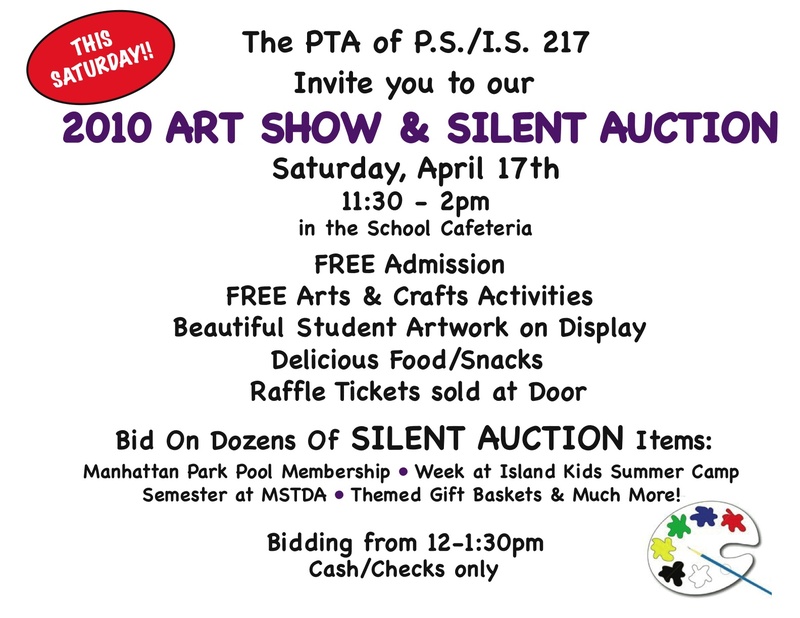 As you know, we provided additional shuttle bus service on Sunday, April 11th. During the F train service disruption (12AM to 12PM), we had a total of 372 people taking the Manhattan-bound bus, and 16 people returning to Roosevelt Island. We resumed normal shuttle bus service at 1PM. 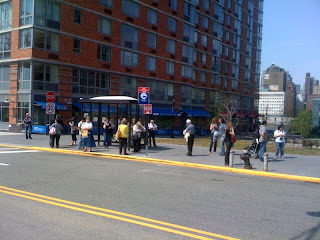 From 1PM to 11PM, we had 130 people taking the Manhattan-bound bus, and 129 people returning to Roosevelt Island. For your review, I have attached a copy of the shuttle bus ridership data for Sunday, April 11th. Here's one data point for the Sunday morning challenge. I waited opposite the school a little prior to 8:40 AM since I thought that the Red Shuttle Bus to Manhattan should be running every 1/2 hour. No such luck. By the time I got to the subway, there was one lone, but pleasantly smiling attendant, telling us that the Manhattan bound trains weren't running and the next shuttle bus to leave from River Walk Bar & Grill would be 8 AM. She didn't know of any 1/2 hour schedule. Aside from the attendant, the only reinforcement for the lack of service was the elevator to the platform was tied off. There was a distinct lack of signage indicating the schedule change by the subway entrance so when arriving to the Queen's bound platform, there were several people on the platform for the Manhattan bound side. I think the timeline in this comment is a little off. The reader probably means that the next shuttle bus to leave Riverwalk Bar & Grill was 9 AM not 8 AM as written. and slightly older kids playing in the Tot Lot. Take a look at Ms. Berdy's entire April photo tour gallery. Also, remember that the RIHS Cherry Blossom Walk is scheduled for Saturday April 24 at 11 AM. Adult Softball. We are trying again this year to have a league. I spoken with the Riverwalk Bar and Grill about having a kick-off meeting in February. I'll have more details in my next column. I never saw a follow-up on the softball. Did I miss it? Looks like it's Zogs. We were never able to get enough interest in this to form a set of teams. In short, we have a handful of people that might be interested in playing, but no team leaders/managers willing to do the work of recruiting/organizing. Anyone want to step up? 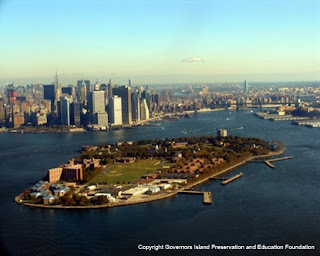 Governors Island & Brooklyn Bridge Park Returned to New York City - How About Roosevelt Island? The city is taking control of Governors Island from the state and can now move forward with plans to turn the prime, if underused, real estate into a lush park and major destination for tourists and New Yorkers alike. 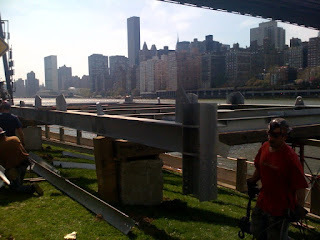 ... Last month, the city reached a similar deal with the state to take over Brooklyn Bridge Park. Now can anyone think of another piece of land or neighborhood in New York City controlled by the State Of New York which should be returned to the City of New York? Come on, you can do it. That right, the answer is Roosevelt Island, which while technically part of New York City, is leased to the State of New York through the year 2068 and run by our friends at the Roosevelt Island Operating Corp., a NY State Public Benefit Corporation created under these NY State Governing Statutes. 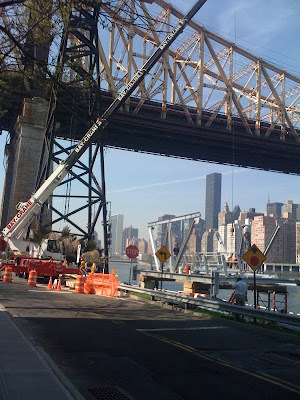 ... returning control of Roosevelt Island from the State of New York to the City of New York. This may not be as far fetched as it first appears. Politicians rarely give up power to others but remember that Mayor Bloomberg was able to gain control of the City's school system when most observers thought that it would be impossible. Perhaps the Mayor can accomplish the same thing for Roosevelt Island that he did for the NYC Public school system - return it to the control of the City of New York where it belongs! "I'm very much in favor of the City controlling our own destiny... Ultimately, you'll be better off when you can touch it, scream at it, deal with it. The Commissioners are accessible... You're much better off moving more of this back to the City. We'll try." "What we're looking for here is democracy," and an escape from the "bureaucratic quagmire" that is RIOC. "I would be very happy to work with you to liberate Roosevelt Island." Will Mayor Bloomberg take on this challenge. Some in RIOC assert that liberation from New York State would be detrimental to Roosevelt Island residents. They say we are much better off being governed by RIOC due to RIOC staff being intimately aware of our local problems and concerns which would not be addressed in the larger NYC bureaucracy. The Q102 Roosevelt Island Bus service route has always been confusing. When the bus was approaching Motorgate Plaza, some were never quite sure whether the Bus would travel either north or south towards Coler or Goldwater Hospitals on Main Street. 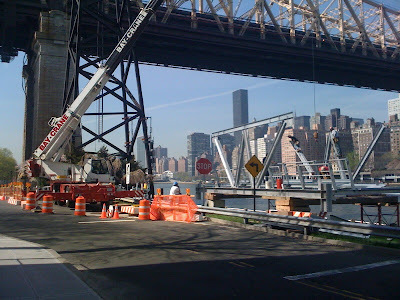 The MTA has decided to change the Roosevelt Island Q102 route to make it consistent. I received the following advisory from RIOC regarding Q102 bus route change as well as elimination of several bus stops. In order to provide more consistent and uniform service on Roosevelt Island, all Q102 service will travel through Roosevelt Island in the same direction. Upon entering the island at the Roosevelt Island Bridge, all buses will first travel north on Main Street to Coler Hospital, then south to Goldwater Hospital, and then exit the island at the bridge. In addition, the following closely-spaced bus stops on the island will be discontinued: (1) 568 Main St, (2) 579 Main St, (3) P.S./I.S. 270, and (4) The Octagon on Northbound Main St. Please use a nearby alternate bus stop. All service in Long Island City and Astoria will remain unchanged. Here is the The MTA Q102 bus service change route announcement for Roosevelt Island. The MTA Q102 Bus Schedule effective Fall 2009 is here but does not reflect the recently announced service change. 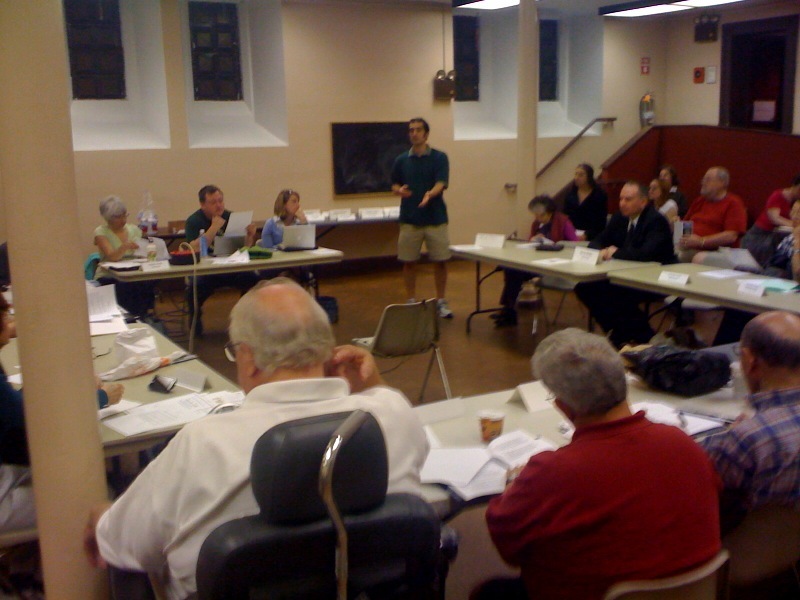 Received the following report from Roosevelt Island Residents Association (RIRA) Island Services Committee Chairperson Aaron Hamburger that was prepared for and delivered to the April RIRA Common Council Meeting. º Tram Project – At the end of March, the project is on schedule, even one day ahead of schedule. º Q-102 – Effective the 1st week of April, this bus route will change from an alternating route to one constant route. It will go north from the RI bridge, up to Coler, then south on Main St. to the subway and Goldwater, turning north again on Main St, stopping at the subway and other Main St. stops before leaving RI at the RI Bridge. º F Train – Operation has been going reasonably well with no new problems introduced by the addition of Tram passengers. 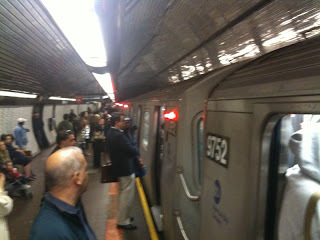 What’s helped is MTA personnel deployed on the platform during the morning rush hour to direct passenger traffic. - Queens Service -- This service ended 4/1/10 due to very low ridership. - Manhattan Service – The schedule will continue thru April. Evaluation of ridership in May could lead to some schedule changes or reductions. Recent reports, however, indicate ridership is increasing. - RI Service – The current system in Southtown – one-way route, south on East Main St., north on West Main St. – will continue until the Tram is back in service. Operation in September and thereafter is under discussion within RIOC with inputs by RIRA Committees and other residents. RIOC seems to be leaning to the one-way (north) West Main St. proposal which in addition to solving the “pedestrian safety” problem has some beneficial side effects (parking spots and an off-road truck loading and unloading area), but one key disadvantage – a 30 second extra walk for passengers going to the subway. Frank Farance has an alternate proposal and there are several more modifications proposed by others. There will be no decision until probably August and vigorous discussion and negotiations until then. The ISC needs to be involved in improving parking availability on RI. º On Main St. there are still too many vehicles illegally parked for long periods of time. Also, many vehicles have lapsed parking stickers. Public Safety must get aggressive in enforcing parking regulations. º East Drive at Goldwater Hospital – This street is still posted “No Parking” despite RIOC’s promise to remove these signs. ISC will follow up on this . Jonathan Kalkin, supported by Frank Farance, has asked the ISC to look into re-installing the RI – 311 system. This is a computer reporting system for residents where various service problems (needed road repairs, safety incidents, bus problems, lighting outages, etc.) can be relayed to the appropriate department of RIOC and follow-up reports made. ISC will accept this challenge. UPDATE 10 AM - THE Q102 Bus route change will begin on April 18 not first week of April.